The Creswick Campus offers on-site b asic college style accommodation. The town of Creswick offers additional accommodation and alternative accommodation is available in the regional and pretty towns of Ballarat and Daylesford. MATRIX staff (office@matrix-inst.org.au) are happy to assist with your accommodation preferences. MATRIX provides on-campus accommodation at Semmens Hall for 20 participants. The rooms contain individual wash basins along with seven private individual bathrooms (containing a shower/toilet/basin) which are shared (i.e. : not attached to the rooms). Semmens Hall also has a common room with a small kitchenette. In addition to Semmens Hall, the Creswick Campus also has The Lodge & AVG House. The Lodge has private individual bathrooms (shower/toilet/basin) which are shared, along with a common room and kitchenette. AVG House has shared individual bathrooms, along with a common room. Family friendly accommodation options can be found in the town of Creswick or in the near-by towns of Ballarat and Daylesford. It is recommended that program attendees stay on campus if possible to encourage an environment of collaboration. Please note that accommodation and the grounds of the campus are non-smoking. Off campus accommodation options may be partially supported by MATRIX at the discretion of the program organisers, with the balance to be paid either by the individual participant or from program organisers’ discretionary budgets depending on the program. 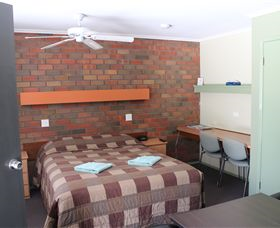 Creswick Motel, a modest option with family rooms, starting at $95 per night. The American, pub and hotel. Twin, double and queen individual rooms with shared bathrooms, ideally suited for small groups. Prices starting at $72 per night. Rossmore Cottage, 2 bedroom (4 person) 1870s miners cottage. Prices starting at $142 per night for a full week. RACV Goldfields Resort, high-end hotel accommodation near the town of Creswick. Ten minute drive or 45 minute walk into the centre of Creswick. Prices starting at $157, with a discount for RACV members. Participants can also arrange to stay in a number of cosy, self-contained AirBnB accommodation options. Off campus accommodation options may be partially supported by MATRIX at the discretion of the program organisers. Transport to and from Creswick will need to be arranged for participants staying in Ballarat (shuttle services, taxis or hire cars). The MATRIX team can assist with this. Creswick is a 20 minute drive to Ballarat. Quest Ballarat serviced apartments. Studios, one and two bedroom apartments available. Prices starting at $163 per night. Best Western Plus Ballarat Suites: a motel with prices starting at $155 per night. Mercure Ballarat Hotel and Convention Centre: single rooms starting at $199. Transport to and from Creswick will need to be arranged for participants staying in Daylesford (shuttle services, taxis or hire cars). The MATRIX team can assist with this. Central Springs Inn: this heritage-listed property offers a variety of room sizes, and family friendly rooms starting at $125 during the week and $180 over weekends. Grange Bellinzona: luxury hotel accommodation. Rooms starting at $195. Daylesford Central Motor Inn: basic rooms and family cabins available. Rooms starting at $195.